Every 20 minutes from every stop from 8:40am to 5:30pm. To view our Hop-On Hop-Off sightseeing tour route click here! All our buses are fully ADA Compliant and handicap accessible. 8:40am, 9:00, 9:20, 9:40, 10:00, 10:20, 10:40, 11:00, 11:20, 11:40, 12:00pm, 12:20, 12:40, 1:00, 1:20, 1:40, 2:00, 2:20, 2:40, 3:00, 3:20, 3:40, 4:00, 4:20, 4:40, 5:00, 5:30pm. 9:20am, 9:40, 10:00, 10:20, 10:40, 11:00, 11:20, 11:40, 12:00pm, 12:20, 12:40, 1:00, 1:20, 1:40, 2:00, 2:20, 2:40, 3:00, 3:20, 4:00, 4:20, 4:40, 5:00pm. 9:20am, 9:40, 10:00, 10:20, 10:40, 11:00, 11:20, 11:40, 12:00pm, 12:20, 12:40, 1:00, 1:20, 1:40, 2:00, 2:20, 2:40, 3:00, 3:20, 3:40, 4:00, 4:20, 4:40, 5:00pm. 9:40am, 10:00, 10:20, 10:40, 11:00, 11:20, 11:40, 12:00pm, 12:20, 12:40, 1:00, 1:20, 1:40, 2:00, 2:20, 2:40, 3:00, 3:20, 3:40, 4:00, 4:20, 4:40, 5:00pm. 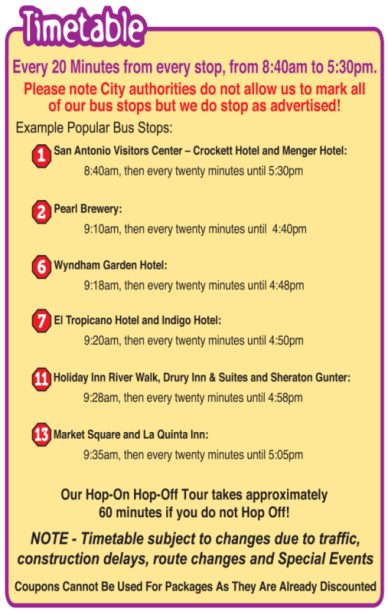 Our Hop-On Hop-Off Tour takes approximately 60 minutes if you do not Hop-Off. Please note, City authorities do not allow us to mark all of our bus stops but we do stop as advertised! Note: Timetable subject to changes due to traffic, construction delays, route changes and special events.